A nice hump day read for you all is Stanley’s Mazda Miata. This one took a little while to post because I actually ended up getting tons of great shots of his car that I didn’t know which one to edit/post. I usually take a lot of photos at the same angle just in case something went wrong – shaky hand, something pops into frame that I didn’t want, bad focus… Whatever the case is, but last Sunday almost every shot of Stanley’s car turned out impeccable. I think it was a combination of a car that was a colour other than black or white, the nice bright/clear day, and the vibrance of the scenery around us – hard to fail and doubley hard to look bad. I’ve never really seen Miata’s around and if I do, they’re usually beat to rust and you’ve typically got an older gentleman driving it. Stanley’s is one of the first Miata’s that I’ve gotten to spend a good chunk amount of time around and I liked it as soon as he rolled into the parking lot we met at. It’s hard not to love a nicely done car with simple, yet bold modifications. The first thing that caught my eye is the bright red paint. I’ve always said that I loved shooting coloured cars – and most of our friends have black/white/silver cars so I don’t get that option a lot of the time. 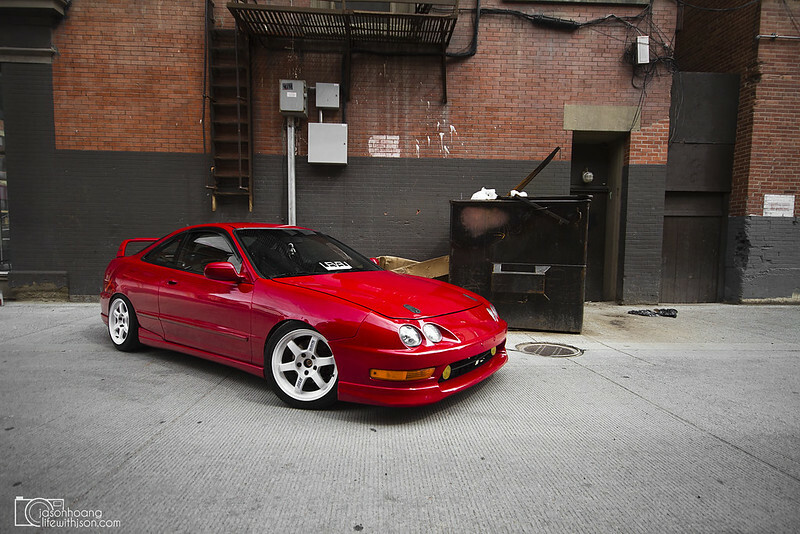 The only other red car I might typically get to see is Punit’s Integra. 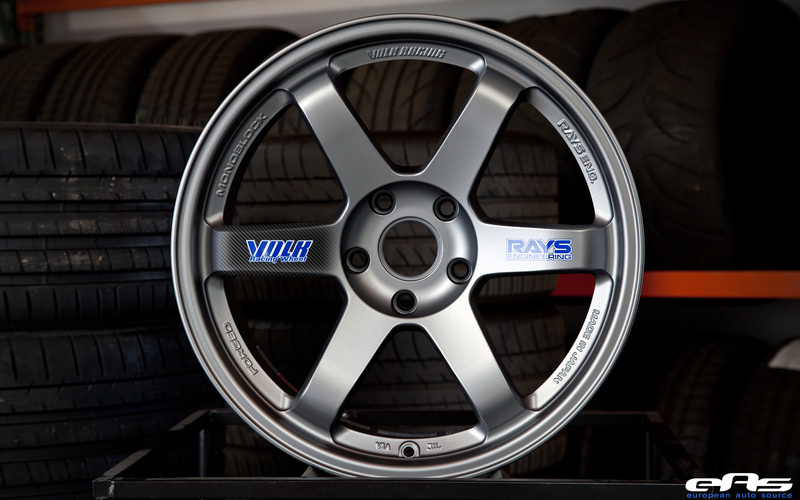 His Miata sits on an aggressive set of 15×9.5 Work Meisters – again – one of my all time favourite classic wheels that just never go out of style and never look bad on any car they go on. The one thing that I was kind of afraid of that day was the full-on afternoon sun. Very little cloud cover and pavement make for a lot of overexposure. Thankfully, all my favourite colours came out to play and helped out in the shoot. All the reds/greens/blues came out to play and resulted in a super vibrant photoshoot. Another shot of Stan’s aggressive fitment. Not too much, not too little… Just perfect. There isn’t an angle on Stanley’s Miata that I didn’t like and I’m generally quite picky. That’s probably why I got so many shots of it – I just couldn’t capture it all! Another thing I miss from the 90’s is pop up lights. I do favour the pop-up look on cars like the Miata and NSX. It’s a cool feature that makes me a little jelly. A cool little thing that Stanley showed me was that these were aftermarket replacements. You see those little lines running all through the front of the headlight? Those are heating elements for winter to prevent ice from building up on the headlight. They’re LED inside too – SO COOL. The classic Smiley Miata face. One of the funny things that I silently noted to myself while shooting Stanley’s car was the sound the door makes when you open and close it. Some of you might not understand it – especially if you’ve always driven in a car post 2000’s – but it brings me back to the day when I shot Romel’s AE86 (slightly off-topic, but related). That day, we were talking about how Romel just replaced all of the door seals and it felt good as new. I didn’t understand it back then (maybe almost 9 years ago?) because it just sounded like metal hitting metal. Arif had joined me on that shoot and he told me that I wouldn’t understand (similarly to how I just told you up there) because my car was too new and that I’d have to try it to understand. Let’s just say, after opening and closing Romel’s door that day – it was like something I’ve been longing to experience again for a long time and admittedly, Stanley’s car has been the only car that I’ve opened and closed that has reminded me of that day. It sounds like a silly thing but believe me when I say that it’s truly something different. This is one of those “you wouldn’t understand unless you’re a car-person” things. You feel the weight of the door, it’s solid, it doesn’t have any technological-feel like soft-close or auto-close. OK, I get it – I’m going on about closing a door – I’ll stop. The point is that this is one of those things from the 90’s that we’ve lost and we’re never getting back. Ever. I’ll say it again – you wouldn’t understand if you’ve never opened and closed a door on a well-kept classic car. Not much more can be said about Stanley’s Miata other than it’s clean as hell. I’ve alluded to my liking towards the 90’s era car period but there’s something about a lot of the JDM sports cars from the 90’s that just doesn’t seem to age. Yes, todays cars have sharper lines and generally bigger bodies, but you take a car made in the 90’s and plop it right smack dab in the middle of cars like my FRS and an EVO X – which btw are also two very different classes of cars – and the Miata would still draw attention and it would still hold it’s own. And to end the post – one last profile shot overlooking the Rocky Mountains (which you don’t really see, but trust that they’re there). We’ll be going for another shoot shortly with some new gear I hope so stay tuned if you want to see more of Stanley’s Miata! I wouldn’t normally post up so many before and after pictures but I was pretty excited about this one. Giuseppe has been wanting a canvas print of a shot I took during out photoshoot this summer for his new house. We’ve been going back and forth between sizes and he’s had some issues with his house that put this on the back burner until last night when he was ready to pull the trigger. He ended up picking one of many of my favourite shots that day and I really wanted it to look extremely clean for a canvas wrap. I spent a few hours last night cleaning up and making sure it was good to go before sending it his way for final approval. This is a perfect example of where the time it takes to edit is really what you’re paying for. Taking the picture is 20% of the work while editing is where the magic happens and I thought this would be a perfect example of that. The before picture. Again, all I’ve added was my watermark. The white balance is off because we were in the tunnel, the reflection of Aldrich’s car is across his whole car and there are a few other little things that can be a small distraction. The last thing I’m sure Giuseppe wants is a reflection of someone else’s car, an orange/yellow hue, and switches and pipes all over the place. So let’s fix that up for him. The white balance has been adjusted to help make Giuseppe’s car pop like it really does, I took Aldrich’s car out of the mix, I removed the pipes and switches on the walls, brought his brakes out a little more, and lit that tunnel up a tad to – I quote Giuseppe – make it look like a million bucks. The part that took the longest was actually getting Rich’s car out of the reflection. It’s particularly more difficult to do on a metallic car (so most cars) because you need to get the grain, the texture, and the lighting all right. Those that do rig shots understand the pain… You have to clone the whole door but you only have a little piece of reference on the car to work with. Dodging and burning help bring out the details as well. The rest of the credit goes to Giuseppe for building an amazing looking car to begin with. I can’t wait to see the finished product and hanging in your house, Giuseppe! Here’s a little filler for you guys. Decided to go back and look at some older photos again from the summer and see if I can spruce up on my editing skills a little more for next year. That’s usually how I cycle my work – over the winter I find some new techniques or ways of editing and I carry that through all the way through summer. I guess that’s what happens when you’re bored. Anyway, one of the things that a lot of people don’t know about editing is just how much time goes into it. For some photos, it can be nice and quick assuming that the car is all clean, there are no imperfections in the paint, the scenery isn’t distracting, etc. That’s not to say that a dirty car needs to be photoshopped clean or imperfections make the car look less visually attractive because there are exceptions. A few that come to mind would be Jackie Tong’s 4Runner – the more dirt the better or Eric Zapata’s 240 – the damage from drifting gives it character and flare. In this example, Punit’s car is more or less in pretty mint condition. Of course, there are a few things that could use the help of my handy clone brush but it’s not about trying to portray the car differently than what it really is, but to help make the photo itself aesthetically come together. The final output. So let me explain a little about what I did – I bumped the exposure up just a notch, increased the contrast and clarity to help bring out the shadows and midtones. I love shooting coloured cars because increasing the saturation ever so slightly on the red is the difference between “red” and “WHOA RED”. That was all I did in terms of “slider” adjustments… I call them that because that’s literally all it is: adjusting the sliders in the RAW editor to achieve a little more “pop”. Once the photo is out of the RAW editor, this is where I think a photo can be made to look good, bad, or somewhere in-between. (That’s not to say you can’t mess it up in the RAW editor with color balance, etc… But let’s assume everyone knows what they are doing). This is the part that people who don’t edit don’t necessarily understand. I like to zoom in to 100% (or more sometimes) and ensure every line and detail looks satisfactory. In Punit’s case, his front lip was scuffed in the original photo so it would only make sense to do his car a favour and do some quick photoshop body work. It’s not necessarily to fake the aesthetics of the car but to just prevent wandering eyes going to spots on the car they don’t need to be. So I’ve been going back and forth between colors for the TE37’s – at times, I thought I was just going to keep them red and run with it for a season, other times I’m convinced that I hate the color and I’m not going to keep them. I mean, I still have lots of time to decide but until I settle (or until it’s too late), I’ll keep juggling with ideas. I’ve really been loving the frozen carbon concept that Bulletproof Automotive recently brought to the scene and it’s a nice, subtle touch to already amazing wheels. The best set they’ve currently done was the frozen carbon on a frozen BMW grey Advan GT for a GTR going for about $6500. A trend is a trend and I know this is one of them but I love the look… Especially on grey or even black to be even more subtle. 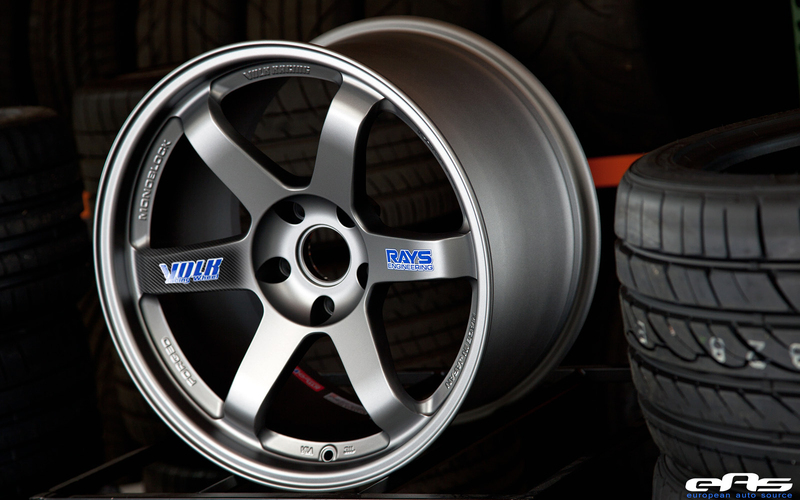 I used the original grey from Volk on these pics but a darker grey or black would look just as mean. What do you guys think?